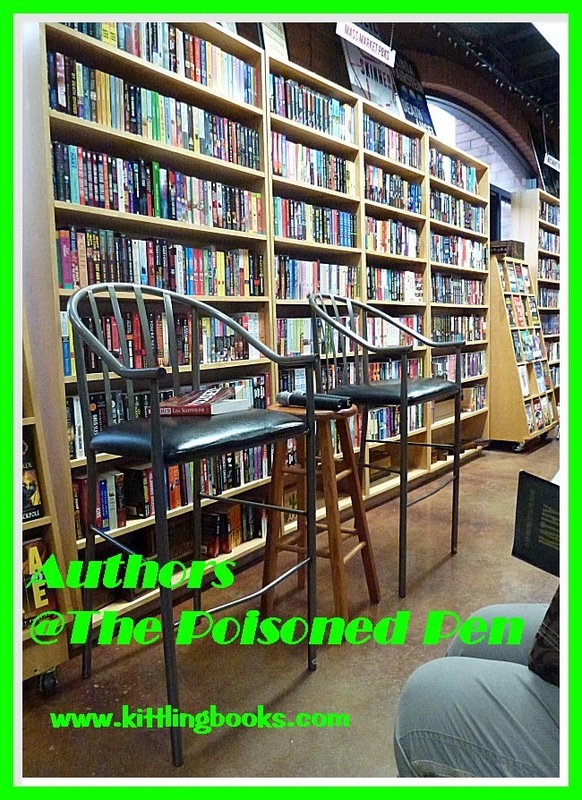 @ The Poisoned Pen with Rhys Bowen and Jenn McKinlay! It was the sixth of November when Denis and I once again found ourselves in the Jeep heading for The Poisoned Pen in Scottsdale. 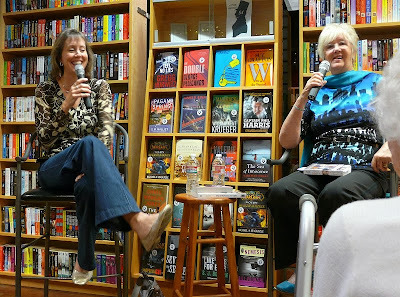 Two favorite authors of mine-- Jenn McKinlay and Rhys Bowen were to appear, and I certainly didn't want to miss them. Denis didn't either. He'd been to a previous event and met Jenn, and when I told him that he would love Rhys, too, that was good enough for him. As usual, we were plenty early to get our choice of seats. (By this time if we aren't there at least an hour early The Poisoned Pen staff undoubtedly know that we're not going to be there!) We both got some reading and chatting done while we waited. 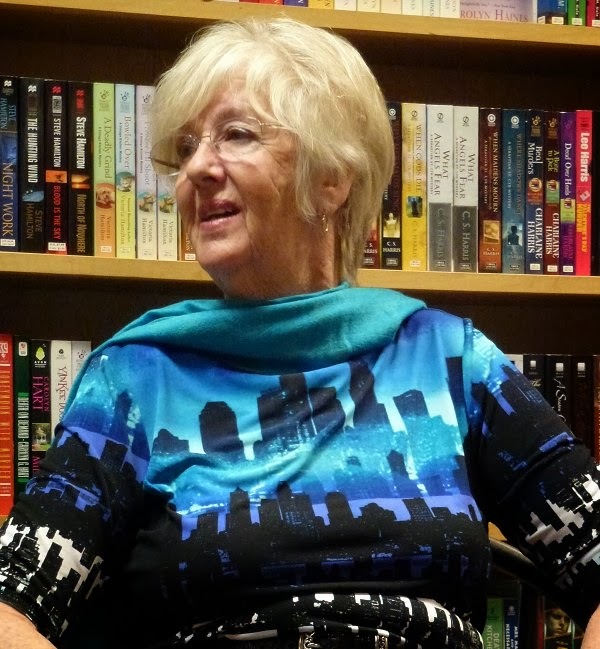 Barbara Peters came in for just a few minutes to introduce the authors and their new books before going out to celebrate her daughter's birthday. She also took the time to run through the events taking place within the next two weeks. 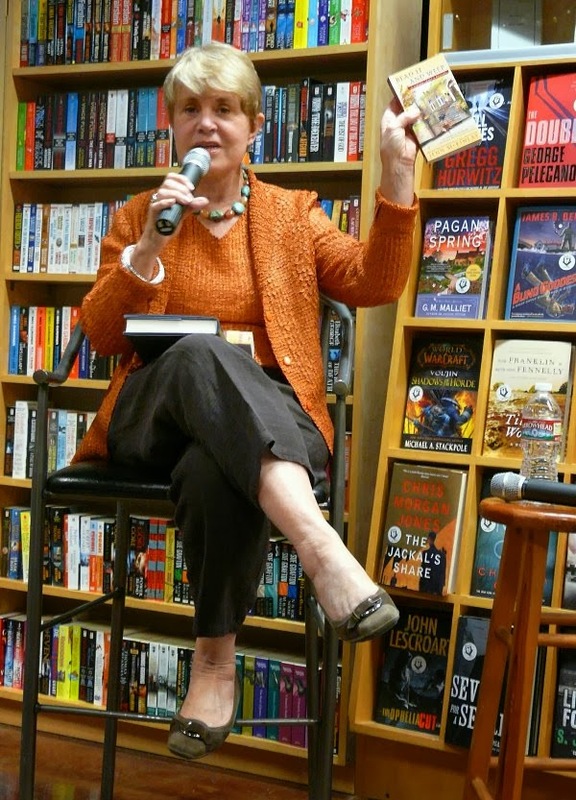 "Books come in gulps, due to when the people in New York want to work and when they perceive people will be interested in their books," she said with a twinkle in her eye. And just like that, she was gone, leaving the event in the capable hands of Rhys and Jenn. "The Book of the Month Club..."
These two writers kept us laughing the entire time, beginning with Rhys's very first quip. Jenn's latest Library Lovers mystery, Read It and Weep, had just become available, and Rhys referred to Jenn's amazing prolificity as "the Book of the Month Club... this is what Jenn writes!" She also mentioned the delicious cupcakes Jenn brought. "I always bring cupcakes," Jenn replied. "That's my bribe!" It was a nice segue into mentioning Jenn's next Cupcake Bakery mystery, Sugar and Iced, which will feature a beauty pageant. 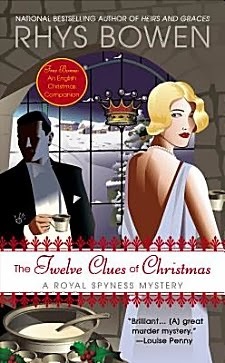 Rhys was there for The Twelve Clues of Christmas which just came out in paperback. She wrote it because "I have a great Christmas nostalgia every year. This book was my chance to relive a classic English Christmas." In the book, Lady Camilla Hawse-Gorzley advertises for a young lady of good background to be in charge of her country house Christmas party. Georgie applies, and Lady H-G is thrilled to hand over the reins to someone in the line of succession to the throne. Georgie is thrilled to escape a dreary holiday season at Castle Rannoch and arrives in the Devon village of Tiddleton-under-Lovey raring to go. It doesn't take her long to see that the guests are a very odd mix. "...do you mix up your children?" Rhys told us, "I write two series, and I'm constantly asked if I get them mixed up. My reply is 'No, do you mix up your children?'" For some reason, everyone's eyes turned to the writer of four series, Jenn McKinlay, who-- (almost) completely deadpan-- said, "I do mix up my children. I sometimes call them by the dog's name. That's why I try to stay on one book at a time like Rhys!" 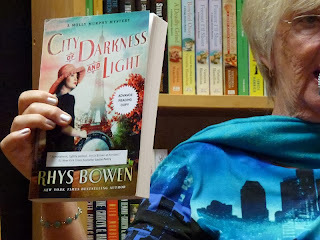 Moving on to her other series featuring Irish immigrant Molly Murphy, Rhys Bowen told us that she got the idea for these books because of Ellis Island. She imagined herself on a ship, just about to disembark there-- "So close you can touch it. What if something happens? What if one person in your family fails the medical exam? What do you do? 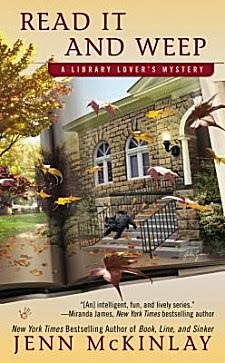 It's the ultimate locked room mystery." 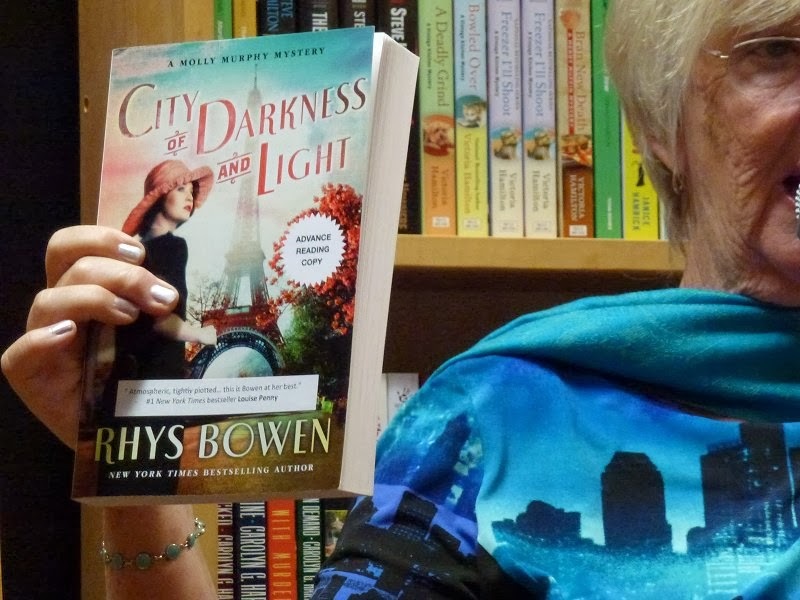 City of Darkness and Light is the newest Molly Murphy book, which will be available on March 4. "I had some tough research for that book in Paris, and before that, two grueling weeks in Nice," Bowen said with a laugh. Someone in the audience asked Bowen how much research she does for both her historical series, to which she replied that she reads at least ten books as part of her work into the background of each novel. 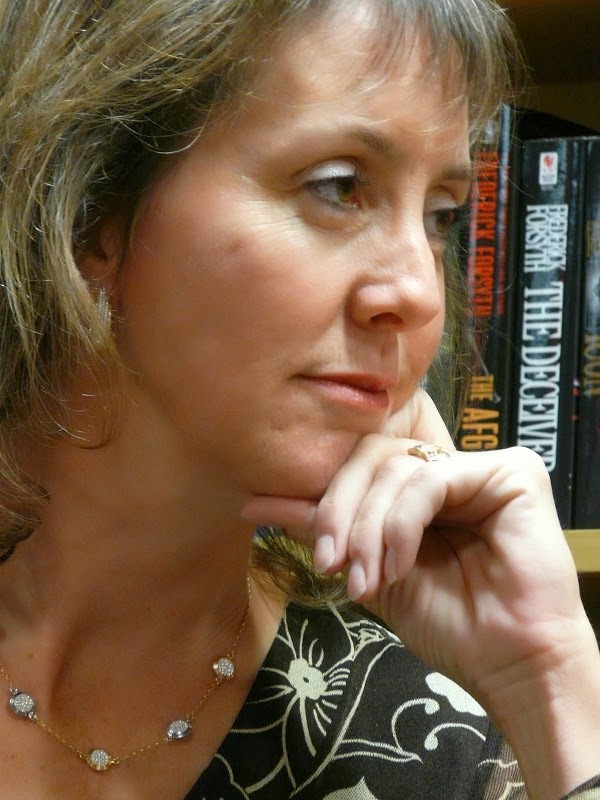 This led Jenn McKinlay to divulge that she moved here to the Phoenix metropolitan area convinced that she was going to write historical fiction, but "I got bogged down in the history!" Jenn learned so many fascinating things in doing research that she found herself wanting to include every scrap. She then turned to Bowen and said, "There should be a Molly Walking Tour of New York City." Rhys liked the idea because "the wonderful thing about it is it's nearly all still there." Bowen has even been contacted by the man who lives in Molly Murphy's house. After explaining why he was emailing her, he did send her several photos of the interior and exterior of the house. 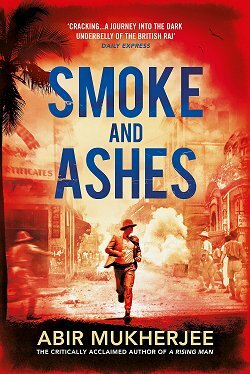 When asked why she writes historical mysteries, Rhys smiled and replied, "I don't have to worry about forensics!" Responding to more questions from our inquisitive group, Rhys told us that she had been asked to write a digital short story for release in January. 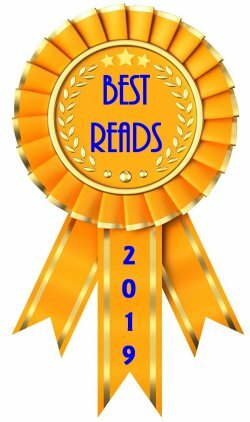 She happened to be taking a look at a list of bestsellers on Amazon when she spied her story residing at #18. "Wait, that's my story! I'd better write it now!" was Bowen's reaction, which provoked more laughter from those of us attending. Queen of Hearts will be the next Royal Spyness mystery. Georgie and her mother will cross the Atlantic and wind up in Hollywood. "I crossed the Atlantic on the Queen Mary II in order to get it all right," Rhys told us. "Notice how none of my books are set in New Jersey?" She is also considering an Evan Evans e-novella, but "I simply can't do three series. I'm not like Jenn; I'd go mad!" 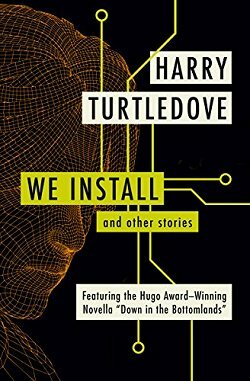 Georgie may be getting a movie based on the first book. The production company has turned down three scripts and is working on the fourth right now. "I don't learn anything about it unless I ask. This has been dragging on for five years. The people I liked for the roles are now getting too old." 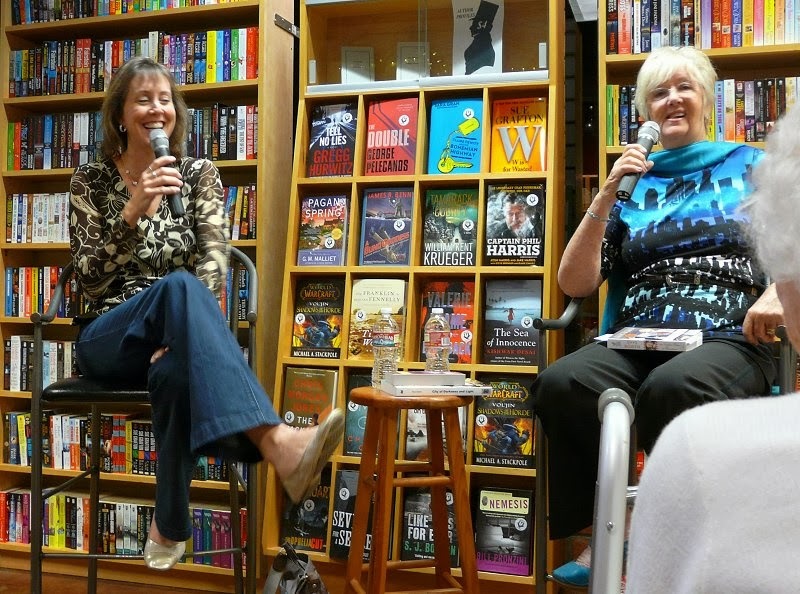 The evening began to draw to a close with talk about how each author writes. Jenn's family comes first, but she does like to spend two to four hours per day writing-- roughly ten pages. Rhys spends about three months writing each book, a minimum of five pages per day. She stops in the middle of a scene, and when she begins the next day, she edits what was written the day before. This gives her the impetus to keep on going, although she did tell us that "Copy editors are crazy. I'm seriously considering writing a piece titled 'I'm Being Stalked by a Serial Comma'!" Authors are usually asked if they use outlines. This evening was no exception. Jenn told us that her first mystery was written without using an outline, and it didn't sell. "What a shocker!" she laughed. Rhys, on the other hand, does not use one. "The first fifty pages are written in pure panic mode. This happens with every book. I like being surprised. I like being challenged." Two authors, two completely different answers. 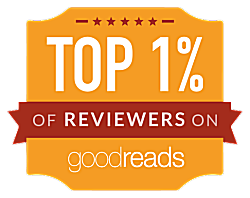 Just goes to show that anyone who wants to write a book needs to find out what's right for them, doesn't it? What a fun evening! The time absolutely flew, and these two talented women made everyone in The Poisoned Pen feel like family. 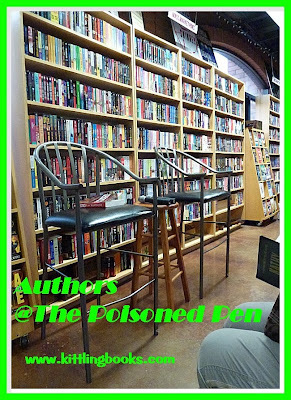 Readers should attend their events whether they read their books or not! Cathy - Oh, a two-for-one at the PP! What fun - I'm so glad you enjoyed your evening. One of these days I'll get there. Sounds like a lot of fun! I would have loved to have heard these two authors. I should go back and read more of Molly Murphy's tales. remind them not to go over the top sometimes out in the real world. These two were a fabulous team, and I'd go to see them again in a heartbeat.